"How easily Life can flick us. Like an idle boy's fingernail against a tiny fly. by a quarrel, a smile, a death--or marriage." So long as King Edward and Lord Hastings stay close, Elizabeth is safe. However, her beloved Ned falls ill and Lord Hastings falls out of favour.Can Elizabeth's wiles keep her out of trouble? Or will they lead her to further trouble...and the hangman's noose? Alright. I think I have a problem and it is this. I love historical fiction, we all know this, if you didn't before now you do. Specifically, historical fiction that discusses English history and even moreso than that the Plantagenet and Tudor dynasties. Oh. My. Gosh. I cannot get enough!! Herein lies the problem: It is the same friggin' story every.single.time. History is history. You can't change it. I know the ending before I even crack open the first page. I am well aware who dies, how, and when. But do you think I ever pass up the opportunity to read about the same tale but maybe from a slightly different perspective? The answer?...Hell. Frickin'. No. I love this genre. So much it almost hurts my chest how much I enjoy this era. It's getting a little ridiculous as well as scary. This version of our story is about Elizabeth Shore, most infamous mistress to Edward IV *swoon*. Oh yeah. Here's another thing. When I read about historical fiction, I do in fact drool over real-life men that existed approximately 600 years ago. Sorry not sorry. So I am a huge fan of Elizabeth Woodville, the Queen and wife of Edward IV, so when I have read other novels mentioning Shore I loathed her. She was the mistress, the whore, the concubine of a historical figure I love and his wife is one of my favs as well. I did not like this woman. Adultery, obvi not okay in my book. However, the writing and perspective of this novel is excellent. I found myself sympathizing with her character and really liking her in fact. I know! Nobody is more surprised than me, let me tell you. Elizabeth Shore is perceived as a good person who made poor choices and loved the wrong man...but she did love him. She is written in such a way that makes the reader understand her perspective and respect her for it. Her life was not easy and she did the best she could. What I also loved about her characterization was her fiery attitude. This woman had an attitude to boot and you heard her opinion whether you wanted to or not. Loved this. My other favorite parts of this novel were the rare appearance of Elizabeth Woodville. There were a few scenes where Shore and Woodville interacted and the tension could have been cut with a knife. Oh man was it uncomfortable. Hilarious. Awkward. Overall, brilliant additions to the story. Had to address that wife that we all knew he had in some way, and the way Martyn does this is quite clever. The dialogue was to die for. I am a little biased because I do love this genre but I felt that while I was reading it I was just zooming through it. I didn't want to put it down. I knew the basics of Shore's story but I HAD to know how she got into the situations she did and what did happen to her after Edward's death? I loved it all. The whole novel had a great pace to it. Lingered enough to keep you wanting more but fast enough to keep you turning the pages. 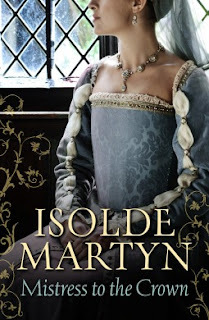 I would definitely recommend this book to any historical fiction lovers as well as people like me who are obsessed with the Plantagenet family. New to your blog and really enjoying it. If you enjoy historical fiction about real historical persons, I can recommend "Life Mask" by Emma Donoghue about the actress Eliza Farren, really good read.